Legacy’s exclusive ExxoTec PVC fabric meant faster installation, greater longevity, and ease of repair for Feed Products & Service in Madison, IL. When Feed Products & Service needed a flat storage solution, it partnered with Legacy Building Solutions for a building designed for maximum efficiency and a lower life-cycle cost. Legacy buildings combine the design flexibility and proven strength of a rigid I-beam frame along with the non-corrosive properties and natural light of fabric buildings. Using accepted engineering techniques and software allows for any number of custom architectural features — including lean-tos for additional space, precast or cast-in-place concrete stem walls and storage bins, active or passive ventilation systems, and large conveyors. The corrosion resistance of the fabric is enhanced with hot-dip galvanized steel frames, proper ventilation, or an interior fabric liner, which places a physical barrier between the frame and any corrosive material. Feed Products & Services needed to expand its Madison, IL, location to accommodate business growth. With several concrete, steel, and fabric buildings already on site, the staff chose a fabric building because of the material’s longevity and ease of repair. 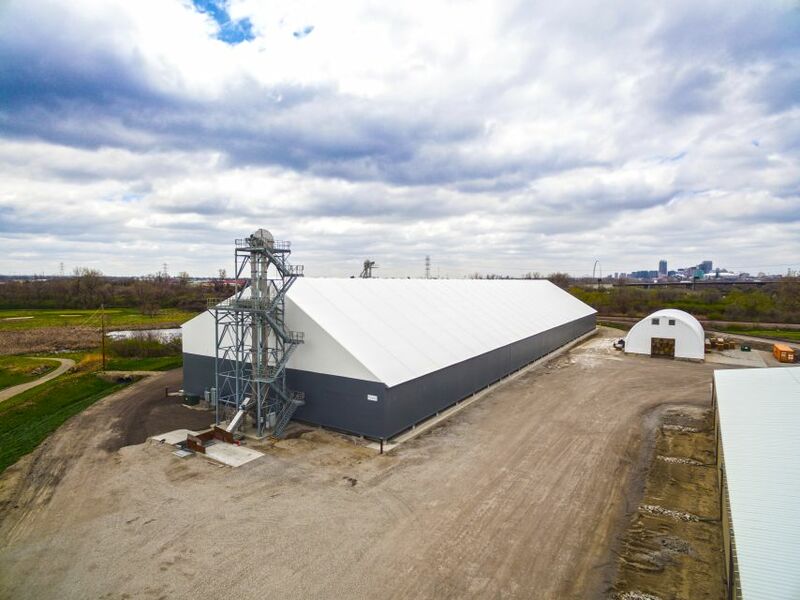 Initial specifications called for two buildings, but after consulting with Legacy Building Solutions, the company made the decision to construct one large building, which gives it additional floor space and greater flexibility for future building use. Rather than the front-end loaders that Feed Products had previously used, the new facility will be filled via a conveyor system. The finished building is 120 feet wide by 460 feet long, with a lean-to measuring 140 feet by 190 feet. The main area of the building houses 40,000 tons of product in precast storage bins, while the lean-to provides a separate, safe area for truck load-out. Legacy Building Solutions partnered with the staff at Feed Products to design, manufacture, and install the building — which ultimately came in at a lower-than-anticipated cost. By using a passive ventilation system and exclusive ExxoTec™ PVC fabric with natural light, the ongoing energy and life-cycle costs of the building are kept to a minimum.